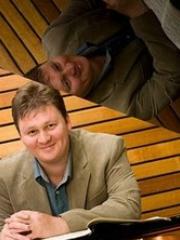 Associate Professor Liam Viney is a pioneering piano soloist, collaborative musician and teacher. First prize-winner of the Lev Vlassenko Piano Competition, Liam has performed regularly in Australia, the United States, Europe and Israel. He has appeared as soloist with the Queensland Symphony Orchestra, the Hartford Symphony, the Queensland Conservatorium Symphony Orchestra, the Queensland Youth Orchestra, the New Century Players and the CalArts Chamber Orchestra in concertos ranging from those of Mozart and Beethoven to Prokofiev and Ligeti. Liam is a member of the Viney-Grinberg Piano Duo with Anna Grinberg: together they explore classics of the two-piano literature and create new works through commissions. Liam is also a member of the White Halo Ensemble.